The department was created in 1999 in order to strengthen research and education within the field of housing and development at Lund University. All of HDM’s staff have long experience in this area and were previously active at Lund Centre for Habitat Studies (LCHS). HDM undertakes research and training in housing from an international perspective: Planning, design, creation, use and management, and the connection between a home and its surroundings from neighbourhood to city level. The goal is to increase our knowledge of how to improve the processes leading to good housing and sustainable development, especially for the poor. The research at the department is mainly focused on Africa and South America. In the early 2000s Prof Subrata Chattopadhyay from Indian Institute of Technology at Kharagpur, India, however was assigned to the department as guest lecturer. For many years HDM has successfully run courses under Sida’s International Training Programmes. Over 800 planners, architects, civil engineers and other professionals have attended courses in courses such as International Construction Management (1990–2000), Architecture & Development/ Housing & Development (1990–2002), Architecture, Energy & Environment (1995–2003), Conservation & Management of Historic Buildings (2004–2005), Organized Self-help Housing (2002–2006), and Urban Housing Management. From 2006 HDM has administered an Advanced International Training Programme on Shelter Design and Development with funding from Sida. This was a follow-up to the previous Sida-sponsored courses offered by the department. More information about the programme running during September 2010 – February 2011. Between 1999 and 2004 HDM also ran two international Master of Science courses, and currently contributes to the Master of Arts in Urban Management and Development, in collaboration with the Institute for Housing and Urban Development Studies, the Netherlands. General information on the postgraduate courses offered by HDM. • Housing policies, strategies for low-income housing and methods for organized self-help housing. • Architectural design and quality from a users’ perspective. • Design of buildings appropriate to the local climate, comfort and energy use. • Rehabilitation and management of large scale housing areas, particularly the privatisation process and its consequences. • Building technology: environmentally appropriate and cost efficient materials. • Evaluation of the design and building process. PhD Erik Johansson is engaged in research on urban climate and outdoor comfort. He defended his doctoral dissertation titled ”Design and Outdoor thermal Comfort in Warm Climates. Studies in Fez and Colombo” on Friday 15 September 2006. Faculty opponent was Prof. Koen Steemers, Director of the Martin Centre for Architectural and Urban Studies, University of Cambridge, UK. Go for the full-text version of the thesis. 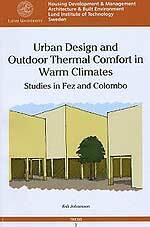 The project was funded by the Swedish International Development Cooperation Agency, Sida, and dealt with the influence of urban design on microclimate and thermal comfort around buildings, based on field studies in two cities – Fez in Morocco and Colombo in Sri Lanka – which represent two climate types that are common in developing countries: warm-dry (Fez) and warm-humid (Colombo). The main objective of the research was to deepen the knowledge on how urban climate and thermal comfort vary within the studied cities in relation to urban design. In Sri Lanka Johansson has worked in cooperation with the University of Moratuwa. In Sri Lanka, Rohinton Emmanuel from the Dept. of Architecture, University of Moratuwa, organized the field work. His knowledge and experience in the field of urban climate in the tropics provided invaluable input to Erik’s work. Prof. Christer Bengs at the Dept. of Urban and Rural Development at the Swedish University of Agricultural Sciences in Uppsala was also to some extent involved in the project. More information about Erik Johansson’s research. Later, Dr. Johansson has been involved in a research project, funded by Sida/SAREC, together with Prof. Christer Bengs on “Climate-conscious Design of Low-income Housing Areas in Guayaquil, Ecuador”, and then in November 2009, Prof. Bengs and Dr Johansson were awarded SEK 1.95 m as a three-years research grant (2010–12) from the Swedish International Development Cooperation Agency, Sida, for a new comparative research project entitled ”Informal settlement planning – land use, climate and energy; the cases of Guayaquil, Dar es Salaam and Pune”. More information about the 2009 Sida grants. The project involves Maria Isabel Rasmussen (photo), Lecturer at the department. The research project first concentrated on Ecuador, whereas India will be covered in a later phase. In India, the collaborative partners are at Pune University. 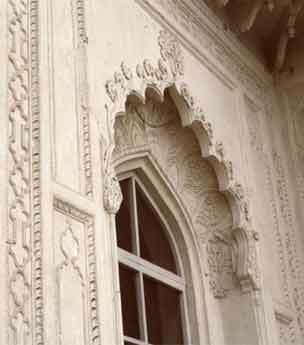 For many years, a postgraduate International training course on Conservation and Management of Historic Buildings has been organised, as a collaboration project betweeen the Department of Housing Development and Management and the Dept. of Architectural Conservation and Restoration, Lund University. The courses were initiated and financed by the Swedish International Development Cooperation Agency, Sida. Professionals working in Latin America or Asia are participating. The first three-weeks period of the training is carried out in Sweden, followed by a continuation course in either Latin America or Asia. More information on the programme. In the programme run in 2005/06, no less than nine of the participants came from South Asian countries, two from Bhutan (Karma Gelay and Karma Tshering), two from Nepal (Ram Govinda Shrestha and Rupa Dongol), two from India (Unmesh Kirtikar; and Ujjwala S Khot), two from Sri Lanka (one of them Shanthini Balasubramaniam from the University of Moratuwa), and one from Bangladesh (Sazzad Hossain). Seven of them appear on Lars Eklund’s photo above. 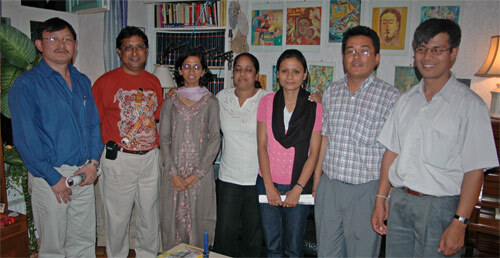 In the course run in 2004 five of the participants also came from South Asia. They were Harsha Munasinghe from the Dept. of Architecture, University of Moratuwa, Sri Lanka; Sumedha Mathota from the Mahavihara Project, Anuradhapura, Sri Lanka; Farzana Mir from Bangladesh; Yogeshwar Parajuli from Nepal; and Reshma Shreshta Duwal, from the Culture Heritage Duwal, Kathmandu, Nepal. Sida funded postgraduate year-long training courses on ”Architecture, Energy & Environment – Tools for Climatic design(AEE)”, and shorter courses on ”Housing and Development and International Construction Management (HDM)” were given from 1990 to 2002. These courses are however not given since 2003. A number of the students at the course on Architecture, Energy & Environment – Tools for Climatic design (AEE) regularly came from South Asia, and wrote research papers then published on the Internet. • Varuna de Silva from Sri Lanka (Senior Lecturer, Faculty of Architecture, University of Moratuwa). As this course ran for the last time in 2002, all alumnis (previous participants) from the Architecture & Development courses (the former name for the course) between 1990 and 2001 and the Housing and Development course in 2002, were invited to a follow-up seminar that was held in Namalundu, Zambia, 12–17 October 2003. For several years the department also offered an international Master of Science degree programme on Urban Housing Management, a shared initiative between HDM, Lund University, and the Institute for Housing and Urban Development Studies (IHS) in Rotterdam, the Netherlands. IHS still offersPost Graduate Diploma Courses and a Masters programme with different specializations. More information.